The mystery of Butters may be unlocked during tonight's episode of South Park. The plot synopsis for "Going Native" indicates that this will be a very Butters episode, and in the grand tradition of classic comedies (I am mainly referring to The Brady Bunch and Full House here), a trip to Hawaii may be in the cards. It's a wonder the series hasn't already followed in the footsteps of the Bradys and Tanners in heading off to our 50th state for an episode. Alas, the journey to Hawaii doesn't appear to be due to a fun family vacation, but rather, Butters' attempt to connect with his roots. Here's Comedy Central's plot synopsis for tonight's episode of South Park. When Butters starts acting out at school, his parents realize it’s time to tell him why he’s not like all of the other kids. He must travel to a foreign place to learn the ways of his people. 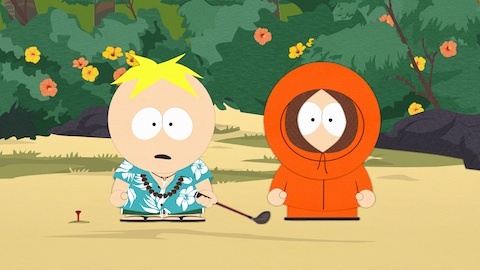 It will be a difficult trip for a young boy to make alone, so Butters chooses Kenny to travel with him to the distant and secluded island of Hawaii. He seems to be taking the tourist approach by getting in a round of golf and sporting a floral shirt. Kenny, on the other hand, hasn't even unzipped his parka.